Randy: Our house, it has no internet. Kyle’s mom: Oh my god. Randy: We’ve got nothing, it’s just gone. Gerald: Come in, you can use our internet until you figure out what to do. Gerald: No, No, our internet can’t be broken, I’ve got to get an attachment Larry sent me last night. Randy: It’s not working Gerald. 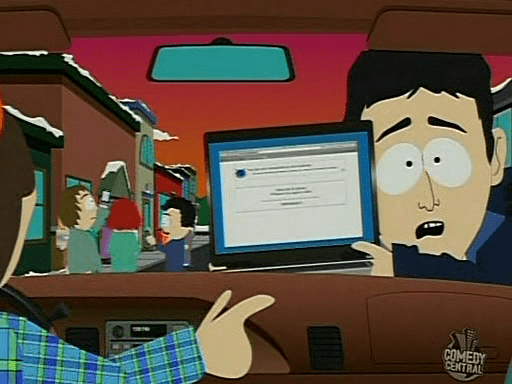 Gerald: But it has to work, maybe if I..
Randy: YOUR INTERNET’S NOT WORKING GERALD. FACE IT. Obviously we do have internet, or else this wouldn’t be getting posted, but when I woke up this morning, we had no internet. I sat with my bowl of cereal in front of the computer feeling at a loss. We form habits through repetition. If my morning habit was to get up, drop into the local shop and pick up the paper and then come home and read it over breakfast I never would have even noticed the net was down. Instead, my morning habit is to wake up, get a bowl of cereal and then open my feed reader to see what’s going on in the world – but it’s a world according to the internet. Whilst South Park might tend towards a style of exaggerating things, they certainly know how to make a point about current trends, and they have a funny habit of hitting the nail right square on the head.